Orthodontic treatment in Ahmedabad- is a way of aligning the teeth in the jaw, to improve the appearance of the teeth and get a good smile. It can also help to look after the long-term health of the teeth, gums and jaw joints, by spreading the biting pressure over all the teeth. Why should I have orthodontic treatment in Ahmedabad? In some patients, the upper front teeth are placed forwardly which may increase the chances of fracture of these teeth. Orthodontic treatment can help to get the teeth in the correct position. In others, the way the upper and lower jaws meet can cause teeth to look unsightly and lead to an incorrect bite. Orthodontic treatment may be able to correct both. When the teeth don’t meet correctly, this can put a strain on the muscles of the jaw, causing jaw and joint problems and in some cases headaches. Orthodontist can help by correcting the position and equalizing the biting force evenly and reduce the strain. Orthodontic care is not just cosmetic in nature. It also can benefit long-term dental health. Straight, properly aligned teeth are easier to brush and floss. This can help reduce the risk of tooth decay. It can also help prevent gingivitis, an inflammation that damages gums. At what age should I have orthodontic treatment in Ahmedabad? Orthodontic treatment is generally best carried out in children, but adults can have orthodontic treatment – and more and more are doing. Age is less important than having the proper number of teeth. In children, it may be necessary to wait for enough teeth to come through before starting treatment. What does orthodontic treatment in Ahmedabad involve? The most important thing is to have a full examination. This will usually involve looking at your teeth, taking x-rays and making plaster models of your teeth. Your dentist or orthodontist will then discuss what treatment is possible. Once you are sure you want to go ahead, the treatment can begin as soon as you have enough permanent teeth. Will I need to have teeth taken out to make space? How is the orthodontic treatment in Ahmedabad carried out? Everyone has a slightly different bite, so the treatment techniques vary. Braces are the most common approach and help move the teeth slowly by applying precise amounts of light pressure over a long period of time. 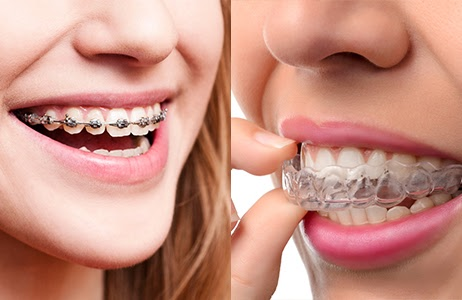 The active phase— Braces or other appliances are used to move the teeth into proper alignment and correct the bite. The retention phase— A retainer is used to hold the teeth in their new positions for the long term. In addition to braces, orthodontists in Ahmedabad sometimes use special appliances (called functional appliances) to direct the growth of the jaw in young children. When teeth need to be guided more accurately, fixed appliances are used. These appliances have brackets and bands temporarily stuck to the teeth, these are braces. Visible braces are of 2 types either metal bracket or ceramic/tooth colored bracket which are stuck on the front surface of all teeth. The newer variation is the Self ligating brackets available in both the metal and ceramic.The major benefit of self ligation is short duration of treatment and better oral hygiene maintenance. 1) The Lingual Bracket system– involves brackets on the inner surface of teeth which cannot be seen from the outside. 2) The Clear Aligners– This is a removable and invisible treatment option which involves wearing a series of clear/transparent trays throughout the day only to remove while eating,brushing and flossing. Every aligner is worn for 2 weeks and moved to the new set-slowly the teeth start moving and reach the straightened position. Ask your Orthodontist the best option that suits you. How to take care of Braces? Brushing carefully is more important with braces treatment as lot of food debris can stick around the brackets.There special small brushes called proxabrush which help to clean the debris around the brackets and elastics. With braces you should avoid eating too much sticky and hard food as that can lead to breakage of the brackets and delay the treatment time.